One constant of Liverpool FC is that when it comes to sacking managers we don’t do Night of the Long Knives-style decapitations. From Dalglish to Dalglish, the removal of managers has been flagged in advance. It’s a well-worn football meme that the vote of confidence is to be ‘dreaded’ but all other things being equal a public expression of support is more useful than a public display of non-support, and the deafening silence from Boston when Kenny Dalglish went there to present his vision for the future spoke volumes. Personally speaking, by which I mean I have zero evidence for this assertion beyond a vague feeling about the nature of old-school football men and their attitude to the suits who govern their lives, I think it is likely that Kenny had a chance to salvage his job when he spoke to John Henry et al last Tuesday and he blew it. The men (I’ve not researched it, but it seems unlikely there are any women involved beyond trophy wives/mistresses) of Fenway Sports Group are not immune to sentiment, or at least they are capable of seeing the value of sentiment. They’ve made a virtue of the ramshackle nature of Fenway Park, touting it as ‘America’s Most Beloved Ballpark’ and had Kenny gone to them and said that he had the support of the fans, Anfield was sold out every game because of his presence, give me another year and I’m confident I’ll turn it around, they might have been swayed. I doubt that’s what happened though. Instead Kenny would have gone in and asked for one hundred million bucks with which to improve the squad. That’s what chairmen are meant to do, right? Just sign a blank check [sic] and leave the football to the football men. Not any more, Kenny, not any more. Now, I emphasise once again that I have no evidence for any of the above. It’s possible he walked into the room, was told he was fired, could he please not make a scene as it would be damaging for the club’s future prospects and don’t touch anything on the way out of the building. Whatever happened, he’s gone and it administers the last rites to what has officially been the worst season since Liverpool were last relegated. That was the reality facing the owners, and in the end that was what did for Kenny. What on earth went wrong this season? It was just over a year ago that we beat Fulham at Craven Cottage with a performance of sublime virtuosity, so much so that most fans assumed the emphasis would need to be on the defence (where little was done during the summer) or the midfield (where, with the arrival of Henderson, Adam and Downing, lots was done). No-one was talking about problems up front. Carroll would probably come good and Suarez has already arrived so there was little to worry about on that score. Yet it was up front that did for us in the end. Our propensity for hitting the woodwork did mitigate the incompetence to some degree. All season long Man Utd fans would pompously declare that since neither the bar or the post was ‘the target’ hitting either was a sign of bad play rather than bad luck. Which would be fine, except they all started bleating about how unlucky they were when Evra hit the post against Everton when 4-2 up. Had that gone in, Man Utd would have won the league. That’s how close they were, and that’s even before you factor in the helter-skelter finish to the Man City-QPR game on the final day. We have been unlucky with all the shots hitting the woodwork, and we shouldn’t be made to feel that it’s sour grapes to say so. But if even half of those chances had gone in, and you’ll probably find in more than a few cases we scored moments later, we’d probably be ten points better off at best – you can’t just add a goal to every draw and say presto! that’s ten extra wins. Ten points would do no more than lift us ahead of Everton. So bad luck can only hold you back so much. The only game I got to see in the flesh this year was against Blackburn and the one-dimensional nature of our play was terrifying. For years people lamented that we weren’t getting the ball wide and Stewart Downing’s stats – 2011/12 Premier League record: goals 0 assists 0 – would suggest that we didn’t do much of that this season either, but against Blackburn he dutifully got to the endline and got decent ball into the box on numerous occasions. It was so utterly predictable though that Blackburn, who conceded the most goals away from home all season, had no problems counteracting it. Stuff bodies in the box, don’t lunge at anything. It was a lesson not heeded by Charlie Adam as he slashed at a corner to give Blackburn the lead. Things improved in the second half but it was more by accident than design and you couldn’t begrudge Blackburn the point they took from the game. When you’ve been outfoxed by Steve Kean, you’re in trouble. The management must take the blame for the lack of a Plan B that so blighted our season, especially at Anfield. But the blame for what happened after the Carling Cup final can be laid at the feet of the players. The win over Cardiff has to have been the least-pleasurable penalty shoot-out victory we’ve ever experienced. Quite apart from coming against a team we should be battering – their most noteworthy name would only be recognisable in the same manner that Steven Spielberg’s non-union, Mexican equivalent, Señor Spielbergo, is recognisable – penalty shoot-outs are a lot more satisfying when you come from three goals down or equalise in the last minute. Nevertheless, a win was a win and it was not unreasonable to think that the season would be a success. Newcastle United haven’t won a major domestic trophy since 1955, yet within months of arriving at Anfield and for all the brickbats, Andy Carroll had already won something. That’s what it means to be Liverpool FC, and surely the players could play with more fluency now they had that first piece of silverware in the cabinet. Not unreasonable, but wrong. Instead they threw in the league towel, an insult to each of the people who paid good money to see the ground be stunk out week after week. The most impressive individual performance of the season came in the FA Cup final when Carroll tore Chelsea apart for thirty minutes. Part of his awesomeness that day was situational as he revelled in the wide open spaces of Wembley against the increasingly carthorse-like figure of John Terry. But much of it must be ascribed to a player saving his best form for the biggest occasion. The only luck Liverpool got in the cup competitions was the penalty given against Manchester City’s Micah Richards for handball. Otherwise, Liverpool got through by dint of being the better team in every game. With that in mind, you’re entitled to ask what team turned up for all those league games – two super cup wins over Stoke, two utterly dire performances against the same opposition in the league. There’s enough in all of the above to make you come to the conclusion that, however much a giant he might be, Kenny had to go. Now that the deed is done though, what next? Bring up André Villas-Boas’s name and suddenly sacking Kenny doesn’t look too clever. Given his experience at Chelsea, Villas-Boas would be entitled to some manner of reassurance that he’ll get longer than 256 days to implement his vision for the club, reassurance he won’t get from the treatment of his predecessor. If the club’s greatest player can only get one full season to make the club a success, how long is Villas-Boas going to get? The season has been a barely-mitigated shambles, and one can’t accuse John Henry of being duplicitous about his short-term targets. Anything less than fourth-place was a disappointment given the investment made. But if that’s the case, he’d better prepare for a lot of disappointment. The two Manchester clubs are surely locks for the top four for the foreseeable future, Arsenal have developed the knack of qualifying and Chelsea are likely to make the investment necessary to get back there before too long. Would any manager relish taking the job in those circumstances? A time may come when we’ll regret not having Kenny’s presence on the touchline as a lightning rod for criticism. Arsene Wenger expressed the opinion this season that qualifying for the Champions League is as good as a trophy. To my mind it’s a daft proposition. What good is being in the CL for fifteen consecutive seasons, as the Gunners will be next year, if you haven’t won it? Arsenal fans will no doubt have some happy memories of individual wins but ultimately they all pale into insignificance against our one win from a mere eight appearances in the competition under its current format. Still, the evidence of this season suggests that Fenway Sports Group agrees – fourth is first, eighth is nowhere. I’m still inclined to think well of their intentions. If anything, firing Kenny suggests that they really have bigger plans for the club, that they’re willing to make the investment to knock either Chelsea or Arsenal (most likely the latter) out of their perennial spot as top four contenders. They’d better be ready to do this, because if things don’t improve they’ll regret not having the King to intercede with the mob on their behalf. This entry was posted in Liverpool, Shankly Gates and tagged Kenny Dalglish on 17/05/2012 by deiseach. Q: Who are the three greatest hurlers of all time? For years I railed against developing cults around individual sportsmen. Success is ultimately a function of talent and inate ability. The thinking that certain individuals are bestowed with a charisma over and above their natural flair that could raise the output of those who come into contact with it was an after-the-fact fantasy. Forget pride or passion. Give me performance. It’s been a bit of a shock then to see the extent to which Liverpool have thrived under Kenny Dalglish. 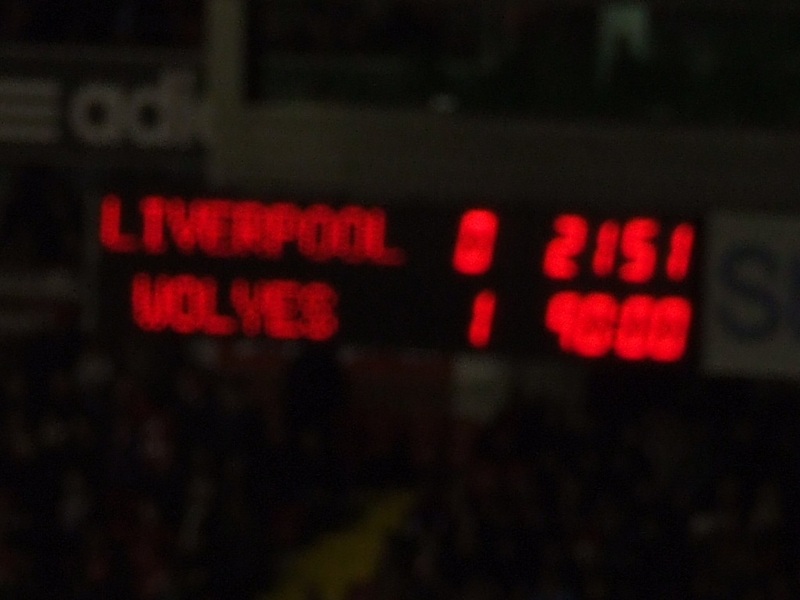 At the start of the year I was at Anfield when Liverpool had to rely on a last-minute goal to beat Bolton Wanderers. Yesterday the last-minute goal was a consolation for Bolton and featured one of the most desultory celebrations you’ll ever see. The Trotters had been given a dose of the trotts from the Reds and they knew it. How times change. What has wrought this change? Owen Coyle was quick to point out the megabucks that Liverpool have spent, and it’s not something that could (or should) be dismissed. If Bolton were given a free £20 million to spend on one player there’s no way they could lump it on a player of Jordan Henderson’s stature, yet Liverpool can do it and just move on to the next one. Money doesn’t talk, it swears, and that’s a Rab C Nesbitt level of profanity. And yet, someone who grew up in the mean streets of the Gorbals like Owen Columba Coyle should take no offence when I say that there’s a reason he has never been given access to the kind of money that fellow Glaswegian Kenneth Mathieson Dalglish has received. Both may share a memorable middle name with Diego Armando Maradona and Edson Arantes de Nascimento, but in sporting terms only one of the Jocks is mentioned in the same breath as those two. Snobbery does have a real impact. I was at Liverpool’s last match against Bolton on New Year’s Day. There was a toxic atmosphere at the game, despite having gotten shot of George Gillett and Tom Hicks. Contrast this to the giddy text I received from my brother-in-law raving about the party atmosphere that pervaded Anfield yesterday. There was none of the tension you might have expected based on Liverpool notorious ability to shoot themselves in the foot (see: the last home game against Sunderland). The return of Kenny Dalglish has injected a sense of belief into the club that no-one else could have managed. Which is great news for those of us looking to re-sell season ticket vouchers back to the club. Result! That was well before my time but his legend was well and truly established by the early 80’s. There were a lot of noteworthy names on that Cork hurling team, but JBM was the man. If nothing else he won just about everything the game had to offer. From what I can see, the only combination of hurling/football + Senior/Under-21/Minor/Club titles that he didn’t win was the All-Ireland Under-21 football title. I’m open to correction on that, but all those titles still pale in significance against his swashbuckling style on the field and self-effacing class off it. He was the archetypal GAA hero and when he retired – itself a perfectly timed gesture coming immediately after another All-Ireland success, thus leaving the stage while the mob were still clamouring for more – the GAA felt slightly duller than before. JBM must be secretly aware of his own self-worth because he only rations out his magic when Cork hurling is in the direst need. Cork were a complete shambles in the mid-90’s when he became manager, shipping a hiding at home to Limerick in one of his first outings. By 1999 they were in the last chance saloon, throwing in a half-dozen newbies against a Waterford team in the unusual place of being confident of victory. Yet that desperate toss of the dice worked, undoing much of the great work we had performed in the previous year and catapulting Cork back into the big time. How much of that was down to him is hard to say, but we’ll find out soon enough because he has stepped back into the breach when Cork are at an even lower level than they were back in the mid 1990’s. Stuffed at every turn in Senior and Minor level, the performance of their Under-21’s in losing that thriller to Limerick should not disguise how bad things are. Add in the poison still lingering in their collective system by the various strikes and they badly need the magic that a great man can bring. I haven’t commented on the speculation surrounding the future manager of Waterford because some of the stuff has been ludicrous beyond belief – Liam bloody Dunne! – but it’s no disrespect to anyone being mentioned to say that none of them has JBM’s stature. No county apart from Cork does. He will inspire just by being there. You only have to look at Kenny Dalglish to see the effect such a figure can have. Life is about to get more difficult for Waterford. Hurling is going to be a lot brighter though. This entry was posted in GAA, Hurling, Liverpool, Waterford and tagged Cork, Kenny Dalglish on 28/08/2011 by deiseach. The other player to transcend greatness to the status of myth and fable is Kenny Dalglish. This is certainly more justified than the [Billy] Liddell legend, as a fair proportion of present day Reds saw him weave his magic. Four different locals have, without any prompting from me, detailed their first memory of King Kenny. None of them speak of the same incident, but the story is always the same. The summer of 1977 saw much fretting about how Liverpool were going to replace Kevin Keegan, and everyone feared that the mulleted Scotsman wouldn’t be up to the job. But once eyes were clapped on Kenny, and he had produced some moment of football genius that would leave Pele or Puskas gasping with admiration, the refrain would be: Kevin who? A star was born, and eight championships and three European Cups later, the glow hasn’t dimmed one jot. Liverpool’s season has all been about one man. This man dragged the club back from the abyss and restored its pride, receiving the adulation of all Reds wherever he went as a result. I refer, of course, to Martin Broughton. Tributes to Kenny Dalglish are almost superfluous at this stage, but another laurel wreath you can add to his honours is that we’ve forgotten just how close the club went to the brink. The appointment of Broughton by George Gillett and Tom Hicks is an example for the ages of how you should be careful what you wish for. Selected with the remit to sell the club at all costs, they couldn’t have imagined that he would sell the club at all costs. The ins and outs of corporate law are beyond me, but the way events unfolded makes it appear that the robber barons expected Broughton to define ‘the club’ as its owners, whereas he saw it as an entity with a separate life of its own. Given the manner in which the world has become prisoner to the corrupt and shameless needs of Gordon Gekko-types, it’s not hard to imagine a scenario where Gillett and Hicks appointed a different man whose view of The Club dovetailed with their view and not that of the fans. If that happened, we would have been utterly screwed. As it was we got a man who was possibly swept up in the romance of it all – the smile on his face as he emerged from the High Court to the adulation of the travelling Kop suggests he was enjoying a moment that few businessmen can ever expect to experience. Or maybe he was just a sober suit who felt he was doing the correct thing. Whatever it was, 2010/11 should go down as the season when Liverpool flirted with oblivion – and survived. As you can see, we’re not in the same league, and that’s even before you consider how much richer all of the other cities are per capita. Liverpool, God bless her, is a provincial kind of place by comparison. Once it became clear that Gillett and Hicks did not have the kind of money that Chelsea or Manchester City had, it was important that we cut our cloth to measure. The appointment of Roy Hodgson was perfectly consistent with such a mentality. Given the resources he could look forward to, no one else was going to be daft enough to take the job. Yet such pessimism brings with it the power of self-fulfilling prophecy. You can’t do any better than what you aspire to, but you can do a hell of a lot worse. Google ‘roy hodgson magic wand’ and you’ll see just how determined Roy was to suppress expectations. At the time I would have agreed with this assessment and it wasn’t until I saw the shambles against Wolves, a team we should be beating with a feather duster, that I realised just how bad things were. Beating Bolton a few days later only confirmed that the team weren’t anywhere near as bad as Roy was making out. He had to go. Next up, his replacement. There was much media scoffing at the rage of Aston Villa fans at the appointment of Alex McLeish as their new manager. How dare football fans allow themselves to be so irrational! And at the start of 2011 I probably would have agreed with the media. Managers needed to be cool, calm and collected. Appointing them in a spirit of nostalgia would be a recipe for disaster. And yet here we are, making the ultimate sentimental appointment in Kenny Dalglish and thriving beyond what would have been our wildest dreams at the turn of the year, and the same hack who was so scornful of Villa fans in June for being so irrational was burbling with delight in January at how “Kenny Dalglish reminds Liverpool who and what they are“. It’d probably enrage Villa fans even more were they to see how Paul Hayward was making the assumption that Liverpool could somehow tap into something intangible – Whacker, the Spirit of Scouse? – to improve results. And while Villa fans would be right to be upset, there’s no arguing with how Liverpool have blossomed under the King. It does present the slightly unnerving prospect that there is a man who is bigger than the club, and the rational part of me thinks much of the credit for Liverpool’s revival can be attributed to Steve Clarke, a suggestion that the club seems to agree with as evidenced by their easing out of Sammy Lee in favour of the Special One’s former henchman. But if the fans are happy, why worry? The most entertaining aspect of the second half of this season was not any individual win, although the obliteration of Fulham was particularly memorable. It was Kenny bouncing up and down the sideline like a puppy on acid, behaviour that provided positive feedback to the fans doing exactly the same thing thus raising that special-at-the-worst-of-times feeling you get from a goal to stratospheric heights. The kids reading this may not recall his demeanour when Liverpool would score in his first stint as manager. Heaven Knows I’m Miserable Now could have been written for him. As with the owners it is all changed, changed utterly. And I claim my £5 for referencing Morrissey and WB Yeats in successive lines. Things may still end badly with Kenny, and perhaps I should maintain a strict neutrality on the subject so that I can revert to my previous position, i.e. that if we “were looking for someone called Dalglish with knowledge of football in the 21st century, you’d be better off giving the job to Kelly“. But lovely and all as the sight of Mrs Cates in the dugout would be, I have to yield to my friend – big shout-out to Ryan! – who demanded for years and years that Kenny be brought back and considered the limp draw with Wigan to be a success because it had the privilege of seeing her father prowling the touchline after being denied it the first time around. Aprés M Hayward, it’s impossible to put a value on the feelgood factor he has brought back to the club. Let us have an end to rationality, and let the good times roll. This entry was posted in Liverpool, Shankly Gates, Soccer and tagged Kenny Dalglish, Roy Hodgson on 03/07/2011 by deiseach. I’m loath to accuse anyone of being an event junkie. I pick and choose the games I go to, and there’s always going to be someone out there who is more committed to the cause, whatever cause that might be. But really, you have to marvel at the speed with which Waterford United have sold out their friendly with Liverpool’s reserve team. Just to repeat: this is a friendly (that’s a challenge match, GAA types) with a reserve team (that’s a B team, GAA types). This is going to be about as bloodless a game as you are ever likely to get, yet the tickets were snapped up as if Kenny Dalglish is going to feed the crowd with five loaves and two fishes. Having attended to a few matches since the last high-profile friendly the Blues played against Ipswich Town, there is no doubt that a competitive game against the likes of UCD is a superior experience. The funds generated by this match – even the matchday programme should be a moneyspinner – make it worthwhile to the Blues. But the tumbleweed that will blow through the RSC at the next home game against Limerick will quickly take the wind out of the collective sails. This entry was posted in Liverpool, Soccer, Waterford United and tagged Kenny Dalglish on 03/07/2011 by deiseach. Some things seem to be hardwired in to the DNA of clubs. This shouldn’t be the case. Why a group of professionals, particularly the diverse group of mercenaries that constitute a modern-day squad, should be influenced by the behaviour of their predecessors in, uh, mercenarydom is a mystery. But it is real. How else can you explain (for example) West Ham’s appalling record at Anfield. They haven’t won since the 1963/4 season. To put things into context, they’ve won on twelve times in the League at Old Trafford versus three times at Anfield (source). It’s a phenomenon that can only be explained by memes that transfer themselves through each common squad member across generations. Or it can be explained the existence of the Gods, in which case you disposing of those lucky underpants you wore during every game throughout the late 70’s and 80’s because your new girlfriend thought they were minty is the reason we’re crap. Such a pattern makes more sense in the context of the fans, who inherit habits from their fathers. So when the Kop applauds the opposition goalkeeper or turns up the gas on big European nights no one needs to be told to do it, it just comes naturally. So it’s kinda sad to see a little piece of the club die in the last week, that is the policy of giving a manager a chance to make his mark. Graeme Souness was drummed out of Anfield pretty quickly, the Loverpool debacle eliminating any leeway he might have had. But Roy Evans, Gerard Houllier and Rafael Benitez were all given sufficient time and resources to come within touching distance of the ultimate prize, that of League champions. As soon as they began to fall back the axe was wielded, second acts being as uncommon in football as they are in American life. So Roy Hodgson is entitled to wonder why he never far past the first scene. As someone who bought heavily into the notion that a manager should be given more than twenty games in which to make his mark, what to make of Roy Hodgson? Oddly enough, the moment of realisation that he wasn’t up to it came in a match which Liverpool not only won but in which they played rather well. It came about an hour into the Bolton game. The Reds were dominating having come from behind but Bolton, a decent team who didn’t wobble one bit when Torres equalised, were proving a tough nut to crack. It was crying out for a change in personnel and/ or formation to discombobulate the defenders. One wag in the Kop, displaying the wit for which we are so renowned (and saying that we are renowned for our wit is the kind of pomposity for which we are so renowned), bellowed out “make a change, Roy!”. Even those of us who haven’t a clue about football (ahem) could see that this was needed, but the bench consisted of one long pregnant pause. The team were on top and any change might jeopardise that dominance. Put simply, he was loath to speculate to accumulate for fear that the change might not work. Holding what you have is fine if you’re flush, but Liverpool had just lost what should have been three banker points against Wolves. They had to go for broke, and N’gog only came off with fifteen minutes to go, by which stage he was a few moments way from being stretchered off with exhaustion. It was cowardice and typified a man who had found himself in a job for which he was not equipped. He had to go. Plenty of people will scoff at such a Damascene conversion, a hopelessly belated acceptance of Roy’s inadequacies for the job. I apologise for not having sufficient knowledge of the game to be able to clearly see this. The fact that I came to this realisation around the same time as John Henry e al, people who until recently thought a ‘football’ looked a giant caramelised peanut, should testify to the truth of that. However, I make no apologies for being acutely conscious of the dignity of the club and what it is meant to stand for, and it is painful to see Liverpool FC heading down the same road that was once one of the things that separated the club from everyone else. Yes, King Kenny is back, and you’d want to have a heart of stone not to be excited by the prospect of the greatest of them all (© A Liverbird Upon my Chest) returning to stick his immovable arse into the opposition’s nether regions. But it would not be too harsh to say that it was his bizarre behaviour 20 years ago at almost exactly the same point of the season – the FA Cup 4th round – that sent us down Not Winning The League Avenue. His CV since then has consisted of winning the League with Blackburn Rovers, spending what was for the time was the kind of money that would have made Roman Abramovich pause for thought, then kept the Newcastle United hotseat warm long enough for the Toon Army to move one step closer to the promised land of being managed by Alan Shearer. Ah, Newcastle. How we all laughed at the Geordies and their ultimately destructive pursuit of Shearer. There’s a large slice of that sense of delusion to the return of Dalglish – and that’s before we even consider the spooky parallels with the Second Coming of Kevin Keegan – fuelled by a whole generation of Liverpool fans who grew up on tales of his derring-do but were too young to understand exactly what I mean by the above reference to his immovable arse. Now they can get to see him work the magic that he wrought with Ian Rush, Alan Hansen, John Barnes and Steve Nicol, only now with David N’gog, Martin Skrtel, Lucas and Glen Johnso . . . have you seen the problem yet? A palm tree defies the hurricane by yielding to it, and zany as the obsession Newcastle fans had with Shearer and Keegan was, it wasn’t going to go away until the club had succumbed to it. Now that this has happened with Liverpool, about the best we can hope for in the short term is that Kenny’s Zeus-like authority nips any spurious thoughts of charging up the table and qualifying for Europe in the bud. European football is in a state of flux at the moment with requirements – gasp! – balance the books or set wages as a proportion beginning to look like they might come to pass. If this happens, Liverpool should well placed to capitalise. Until then, it’s a question of sitting tight. As tight as Kenny Dalglish’s shorts. This entry was posted in Liverpool, Shankly Gates and tagged Kenny Dalglish, Roy Hodgson on 12/01/2011 by deiseach. Sam ‘Fat’ Allardyce received more than a few sniggers some months back when he imagined himself lording it over all and sundry at Real Madrid or Inter. ﻿﻿﻿﻿”It wouldn’t be a problem to me to go and manage those clubs because I would win the double or the league every time”, burbled the man whose closest brush with upper echelons of European football was once donning a moustache that would have been rejected as too camp by Messrs Rush and Lawrenson c. 1984. Given his imagination was once fertile enough to see a colossal insult to Blackburn Rovers in a few vague hand waves from Rafael Benitez, such a fantasy shouldn’t come as a surprise. And yet . . . an analysis of Sam Allardyce’s record shows a man who knows what he is doing. Blackpool, Notts County and Bolton Wanderers all ended their respective associations with Allardyce several atmospheres higher than when he started. Newcastle United was obviously a blot on his copybook, but this was before the Toon Army finally lanced the boil of their demented belief that Alan Shearer was going to make everything all right, this being achieved by the expedient of Shearer making everything all wrong. The rage which greeted Chris Hughton’s recent dismissal shows they no longer believe that all that is needed to succeed is to be able to touch the hem of a former legend (something we’ll presently look at with respect to the Reds). If Allardyce were to get a chance at St James’ Park now, who is to say he wouldn’t make a better fist of it? He rescued Blackburn Rovers from near-certain relegation and they were bubbling along quite nicely until he was given the sack, again to the outrage of Rovers fans who were under no illusions about their place in the pecking order. So why was he fired? It’s possible that he antagonised the Vishnu out of the new owners. Another man with a stellar record at almost every club he has been at is Harry Redknapp, but he has also managed to fall out with the owners of almost every club he has been at, behaving as if all the success they get is down to his genius and the board only an impediment to further glory. The fact that Steve Kean, hardly the experienced hand they claimed they were seeking, has been temporarily appointed in his stead, suggests there may have been a divergence of minds on who calls the shots at the club. Even if that were the case though, and none of the public comments from both parties suggest there was a falling out (either Allardyce is a good actor or his shock at the dismissal is genuine), it seems clear that Allardyce’s face didn’t fit with what the new regime wanted out of their manager. Which brings us rather awkwardly to the man supposedly with the plan at Anfield, Roy Hodgson. Does his face fit? For a long time I would have said yes, although the reasons would appear to be damning the man with faint praise. It is bizarre to say that because he was appointed by the hated Gillett and Hicks that he has to go. If we were to follow that line of reasoning then he should be fired even if he were a success, contaminated beyond redemption by contact with the Toxic Twins. But while it’s easy to dismiss that objection to Hodgson, it gets trickier after that. It’s fair to say his record before Liverpool was less-than-stellar. The only club in Liverpool’s weight division that he ever managed was Inter – in your face, Allardyce! – where the best that can be said is that he did okay, Inter being the continent’s answer to Maria Von Trapp in terms of insoluble problems. The rest of his career has mostly consisted of marginally overachieving with a succession of middle-to-low ranking countries and clubs. Little up to Fulham suggested he was capable to doing what he did at Fulham. He did great things at Fulham though, and people seem to be oddly hasty to dismiss this. He turned around the fortunes of a club on whom a lot of money had been lavished but were now going backwards and with no prospect of a further cash injection . . . sound familiar? For perhaps the manner in which Hodgson’s face fit best was an acceptance that we’re not going to be able to compete in the short-term with Chelsea and Manchester City with their sugar daddies or even Manchester United and Arsenal with their cash cow stadiums. The likes of Frank Rijkaard isn’t going to be attracted by a sell-to-buy prospectus, and as for going back to the future in bringing back King Kenny or Rafa, one would have thought Newcastle’s experience with Wor Alan would have put the kibosh on such romanticism. Add in a few extra endearing qualities – a refusal to engage in shallow shouting matches with everyone around him and most un-footballeresque intellectual streak – five languages! Milan Kundera! – and Roy Hodgson looked the part as manager of Liverpool FC. Then came the Wolves game. It’s all very well being intellectual about it, but it’s impossible to avoid a knee-jerk reaction to such an appalling display against the basement dwellers. Whether you’re a day-tripper getting their once-a-year fix at Anfield or a regular stumping up £40+ for the umpteenth time this season, this was a shocker. After ninety minutes of that, all manner of loony ideas become palatable. Kenny? And could he play. Rafa? We’ll always have Istanbul. Fat Sam Allardyce? He has a great record in turning a lump of pig iron into a Rolls-Royce. And as Darren notes, plaintive calls on the fans to get behind the team are only going to antagonise rather than placate – we’re paying your wages, bucko, give us something to cheer and we’ll cheer! It’s easy to feel sorry for a decent man, but if the remit was to steady the ship then losing to Wolves has to be a torpedo below the waterline. Nothing is likely to happen before the Bolton game, but something has to change. The alternatives are too ugly to contemplate. This entry was posted in Liverpool, Shankly Gates and tagged Kenny Dalglish, Rafael Benitez, Roy Hodgson, Sam Allardyce, Wolverhampton Wanderers on 30/12/2010 by deiseach.